GET GRAVY FOR JUST £39/€49 £29/€35 TODAY! From beginner to advanced, we have 16 carefully crafted voiceover courses so you can specialise in the voiceover style you love. Each course is made up of multi-part modules that are hosted by industry experts walking you through the art of voiceover one step at a time. All of our training is certificated and suited for all skill levels, whether you're a beginner, intermediate or advanced voiceover. There's always something to learn, always a way to get better. Beginner, gaming, audiobooks, home studio, singing, intermediate - we have a course for it, hosted by an expert, to make you an expert. Every week, Hugh Edwards, Peter Dickson, our mentors and special guests host webinars tackling a unique aspect of voiceover. We hold Q&As, editing tutorials, roundtables and inspiring talks to give you the confidence and skills you need to keep voicing. As a member, you have live access to every webinar we host and hundreds of hours of previous webinars held in our webinar library. As an online mentor, we can give you training round the clock. You will enjoy unlimited online access to our panel of professional working mentors who can provide you with ongoing support and training. Whenever you have a question or need advice, our forums are open for you. You can chat with thousands of fellow voiceover artists, learn the latest voiceover tips and have 1-2-1 talks with our mentors. You can even send in your demo reels to our mentors, who will get back to you with honest and straight advice, so you know exactly where you need to improve. You know what’s better than writing to our mentors? Every week, we host a live mentoring session. You can join us for a new session hosted by one of our mentors each week. This time is for you to ask our mentors your questions, practice with them, receive feedback and have a place to gain practical and honest advice on the voiceover problems that you want solutions to. Education is only one part of your voiceover training. You also need the tools to monitor your progress, keep track of your clients and get your voice out there to casting agents. One membership gives you an entire suite of tools to build your voiceover business. 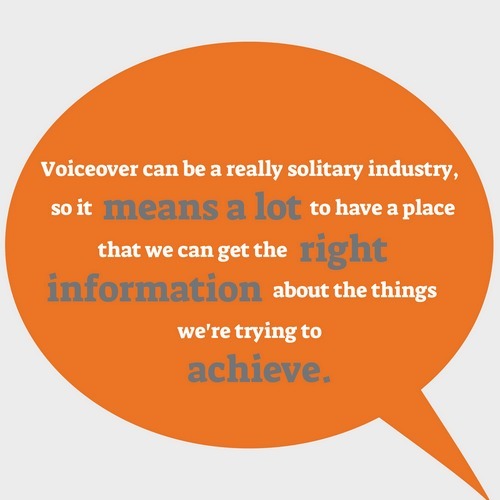 Voiceover can be a solitary business, so that’s why we always make sure that we give our members a place to socialise and learn outside of the internet. Networking and being social with our wonderful community is extremely important to being a well rounded and happy voiceover artist. As a GFTB member, you get free tickets to our social events and discounts to all our workshops and special events. We just want to keep giving you more online and off! It's only £39/€49 £29/€35 a month! Becoming a great voiceover artist isn’t just about learning, you also need the right tools for the job. You can be the best builder in the world, but if you don’t have your hammer and drill, then nothing’s going to get done. 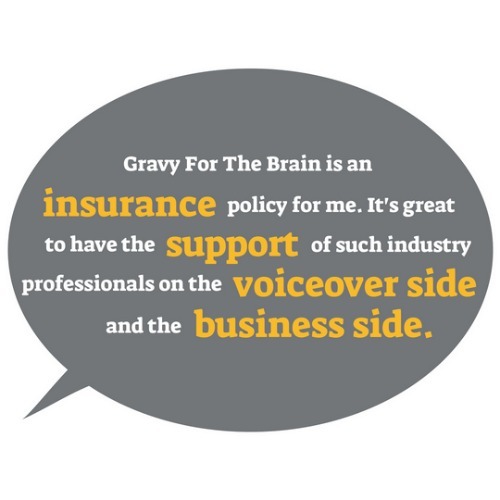 The Voiceover CRM is the secret weapon of Gravy For The Brain - and therefore a secret weapon for you! A CRM system allows you to manage your entire voiceover career. Keep track of your clients, monitor your invoices, control your income, keep in touch with your agents and learn what your audition success rate is so that you can constantly improve. It’s the most powerful tool you’ll ever need and it's now yours! One of the biggest problems that anyone has starting out on a new venture, is losing direction. Not being sure where you need to head next. Our Career Planner gives you a simple questionnaire that you can come back to. It tracks your progress and gives you an updated learning schedule based on what you’ve learned and what you have yet to learn. It's time to plan your voiceover journey! Your Career Profile Website lets you fill in your credits, agents and special talents, and keep them updated as you improve. Your website will then be discoverable in our Talent Finder, which is searched by directors and casting agents looking for the freshest and best working talent. Then we've got you covered! You get everything for just £29/€35 a month. You can cancel at any time, no hidden fees. Start Your Voiceover Journey Today! Get free weekly tips, advice and resources to help you along your voiceover career.